College Home / Academics / Majors and Minors / Public Health B.S. 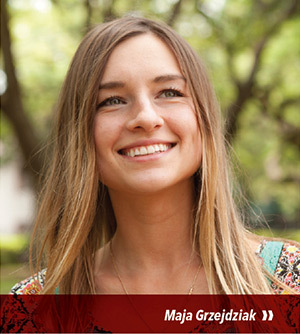 Maja came to the College because she was interested in women’s health issues. She quickly became involved in an active women’s health research team. Along with her coursework, Maja has participated in numerous internship opportunities, including a six-week stint where she shadowed healthcare providers in various roles throughout an entire community hospital system. Maja is still intent on medical school, but she’s now taking a slightly different approach. “Every student should check out public health because it’s growing and very hands-on.” And definitely awesome. Our major offers students a broad understanding of factors impacting population health as well as the opportunity to work with diverse faculty who are exceptional scholars and leaders. Graduates are prepared for entry-level careers, allied health professional programs and graduate programs in public health, health promotion, epidemiology, biostatistics, health policy and environmental health. With strong local, national and international ties to public health organizations, this program exposes our students to unique research and internship opportunities that include advocacy, program implementation and hands-on field work. ❱❱ Recent internships – both local and international – have been in areas such as nutrition, AIDS awareness and water sanitation.